A good cup of tea can be very soothing – but relaxing? Not for everyone. For some people, the caffeine content of their favorite tea can keep them up for hours. For others, it’s just the fact that they took a break to rest and collect their thoughts that gets the re-energized. 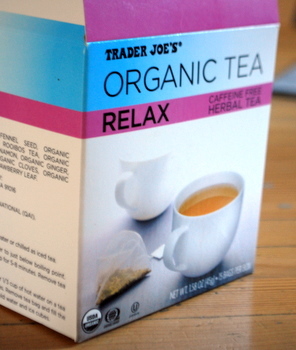 Trader Joe’s Relax Organic Tea is a tea that is actually supposed to be relaxing. It contains no caffeine and is made with a blend of herbs designed to calm and help you to unwind. These herbs include fennel seed, licorice, rooibos, anise, cinnamon, ginger, cardamom, cloves, peppermint and strawberry leaf. With so much stuff going on inside the triangular tea bags, I expected the flavors of the tea to be a bit overwhelming. Surprisingly, it had a nice medium body and a great, smooth flavor. Plus, it seemed to live up to the promise of its name – at least, it did for me. The fennel, licorice and peppermint seemed to come through more than the other elements, with the fennel and licorice definitely having a soothing effect, but the mint adds a nice palate-cleansing finish that left me feeling pretty refreshed.